People want to write the book they know is inside of them, but they run into stumbling blocks that trouble everyone from beginners to seasoned writers. 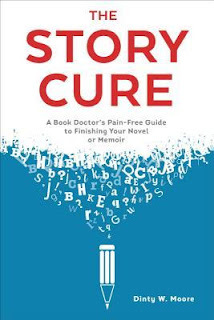 Drawing on his years of teaching at both the university level and at writing workshops across the country, Professor Dinty W. Moore dons his book-doctor hat to present an authoritative guide to curing the issues that truly plague writers at all levels. His hard-hitting handbook provides inspiring solutions for diagnoses such as character anemia, flat plot, and silent voice, and is peppered with flashes of Moore's signature wit and unique take on the writing life. First, I think this book had some great advice to offer the average person writing a book. If you are looking to do edits and re-writes he gives some very simple advice. Second, I thought he very helpful tips that I can use daily in writing. I think the doctor metaphor to writing was an interesting one that I never heard of and it gave a unique perspective, but it was a bit rundant. I also felt that although he touched on memoirs including some experiences that happened in his own life, it did not add to improving my writing. He included some writing exercises, but I didn't always find them helpful, nor were they engaging. I think this book has some practical and helpful advice, but I wouldn't buy it at the store. I give this book 3/5 stars. I think as a first time-writer I expected a lot more and this book fell way short of what it could have been. It has some good pointers, but I don't recommend purchasing. Maybe grab it from your library, dear.